Take off our shoes? Show our feet? They just knew this mzungu was crazy. 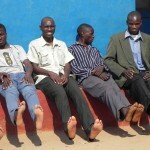 But these Zambian national pastors did not know Romans 10:15. But once I quoted the Scripture to them, they were joyous to take off their shoes and socks and hold up their feet. Yes, they are beautiful to God and beautiful to us as they are the ones that will help reach their people. Missionaries and pastors know that the ministry can be a 24/7 calling, and we are willing to put as many hours into a day, or week, or month, or year as we possibly can. But in a nation of 12-13 million people (Zambia) it takes more missionaries than we could possibly beg to come over. That is one reason the training of nationals is so important. We have a few good “Pauls”, we need many more, but we also need many, many more “Timothys”. The training of national pastors, evangelists, deacons, and Sunday school teachers requires a lot of time, diligence, and prayer. One missionary giving 25 to 30 years of his life to reach an entire nation will fall grossly short, but train national pastors and evangelists to reach their own people and the glorious Gospel can reach into every village and town. These pastors have been called by the same God by which we have been called, They have dedicated themselves to reaching their own people and have given up much to do so. We have come to know several of the national pastors who have given up well paying jobs because it was taking too much time away from the ministry. They had no time left over to study or to visit with the people in their village. Often it is much easier for them to reach people that we may have difficulty reaching because we aren’t familiar with a lot of tribal cultures that may need to be addressed. The tribes do not understand the concept that they will be one in the family of God. There is as much prejudice between the tribes as their is between the races in America. Each one thinks they are better than the others. 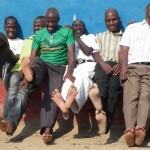 So well-trained Zambian pastors know the areas in which they may need to change their approach. There are some cultural issues that would shock a Westerner, but are viewed as completely normal in their society. We do not know all these variants. Yes, the Holy Spirit leads and teaches in the heart, but even in America people need to have special attention paid to particular areas of their lives as “there is a way that seems right unto a man”. We need these Zambian pastors and evangelists to help spread wide the saving knowledge of the Lord Jesus Christ, and we surely need some help in training them. Pastors, would you be willing to give up 2 weeks of your year to come over and teach? Sunday school teachers, would you be willing to come and teach and to train them on how to set up their own Sunday schools? Deacons, how about coming and teaching on how to be an effective deacon. Ladies, would you be willing to come and teach on Biblical marriage and family to our precious ladies? Teens, you are needed too to show the young people how to live a godly life even with cultural pressures. We would love to have anyone come that has a heart for the souls of the lost and want to be an encouragement to new Believers. If you think the Lord may be leading you to come for a short-term missions trip, let us know. Believe us, you would never be the same. God will change your heart in a great way. Your life will change. If you can’t come but would like to see the work continue, please use the donate button and contribute. We need more support to help the pastors support their families while they come to school to learn (their church supports them after one is formed just like in America). Any time we build a new church extra support is needed for tin sheeting for the roof, for printed Sunday school material, teaching materials, or Bibles. Food is needed to help during times of famine or during the dry season. Medicines are needed to treat the sick. Clothing is needed. The expenses are great, and there are many areas in which we contribute because we want to show the love of Christ to them too. So please, if you can contribute, do so. Even a few dollars goes a long way. But most of all keep all missionaries lifted up in prayer and….come and see the beautiful feet and what the Lord has done! This entry was posted in Our Photo Album, Pictures with a story and tagged africa, charlye, culture, deacon, feet, gospel, jack, missionary, missions, pastors, price, Romans, Sunday school, teachers, tribal, tribe, tribes, zambia on 28/06/2014 by admin.